Below is the last video in the Language of Light series, part 5. Below is the 3rd part of the story about the Language of Light - go for it! about the Language of Light! 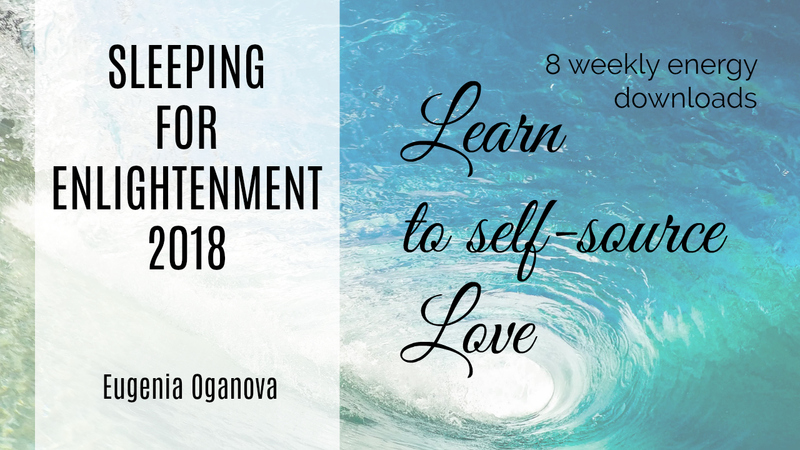 of the Sleeping for Enlightenment 2018 LIVE e-course! Each of these 8 energy-programs takes about 3 months to design and build, and you will receive one per week in a precise sequence to be layered into your Light Bodies and energy fields – all contained inside the holographic field. Some of you might know this holographic field effect as a “tunnel of energy” – a concentrated focusing environment to support your evolution into multidimensionality. It is designed to set parameters for your energy systems to remain in the Higher Self resonance and to enhance your energy-perception and integration of the Light-coded energy transmissions. today 3/5 until 3/10 midnight EST - don't miss it! CLICK HERE to sign up for SLEEPING FOR ENLIGHTENMENT 2018! Each week you receive: homework (video meditation + PDF), an energy transmission, and an “extra help” section where you can ask me questions and get answers, and a Facebook support group for sharing your experience and connecting with others who are taking this e-course with you. The minimum time requirement is 15 minutes per WEEK only! You will receive the energy download either way, but you will get more out of it if you do the homework, which can take as much or little time as you wish. The homework each week is guidance as to what you need to focus on, and steps to clean up space inside you to make room for the new energies, prior to each download. on the Ascension Stairway into the higher dimensions of yourself? During the next five days I will tell you a story about the Language of Light and how it is assembled into the Light Codes. Visit this website tomorrow to WATCH the first part of the story! I hope that you gave the 5-DAY Self-Love Challenge a whirl – it takes only 5 minutes of your time per day to view each video, but the benefits of this Self-Love Challenge, when applied, are life-changing! If you missed it, check it out by clicking here. Learning to Love yourself right is so important, especially in today’s planetary environment. When we project our Love need onto the external environment, we limit our Love capacity. We become dependent on the external world for Love and proof of our worth. Learning to self-generate it, to self-source Love energy, is essential. Sleeping for Enlightenment is a LIVE E-COURSE that I run every spring. This year it is going to be all about self-sourcing Love energy! We must learn to love ourselves properly in order to stay within the planetary ascension timeline, in the Higher 3D Earth, and to be fulfilled and supported during this time of change. Sleeping for Enlightenment is a series of energy-programs designed to upgrade your system to the Higher 3D Earth’s frequencies, to help you wake up and connect to your own Soul. These energy-programs are delivered into your energy fields during the night time while you are sleeping (hence the name) – how convenient! You don’t have to leave your home and travel anywhere – this is an e-course, i.e. you can access all the assignments from the comfort of your home any time on Sundays (during the course’s 8 weeks) when it is convenient for you. The recordings remain available during the course. It goes for 2 months starting on March 19th, one energy-program per week. Each week you get guidance as to what you need to focus on, and steps to clean up space inside you to make room for the new energies, prior to each download. You can do this at your own rhythm, as long as you read the homework once per week (which takes 15 minutes of your time). You will receive the energy download either way, but you will get more out of it if you do the homework! will only be open for the short 6 days! So, if you want to join me, please sign up during these days. Last year most participants signed up in the first 48 hours! I only teach this course once per year, so this is your chance to get on board and upgrade your energy system for more self-love and self-worth blueprints. Check back on Monday the 5th - and sign up!